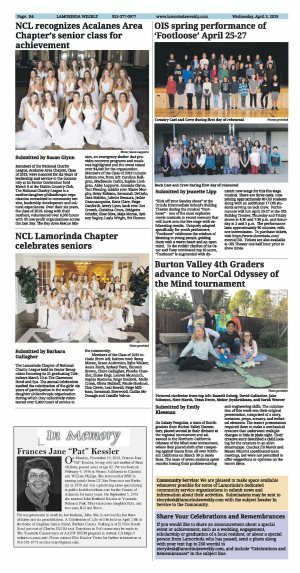 Members of the National Charity League, Acalanes Area Chapter, Class of 2019, were honored for six years of leadership and service to the community at its Senior Celebration held March 9 at the Diablo Country Club. The National Charity League is a mother-daughter philanthropic organization committed to community service, leadership development and cultural experiences. Over their six years, the class of 2019, along with their mothers, volunteered over 6,500 hours with 33 non-profit organizations across the East Bay. The Bay Area Rescue Mission, an emergency shelter that provides recovery programs and meals was highlighted and the event raised over $4,000 for the organization. 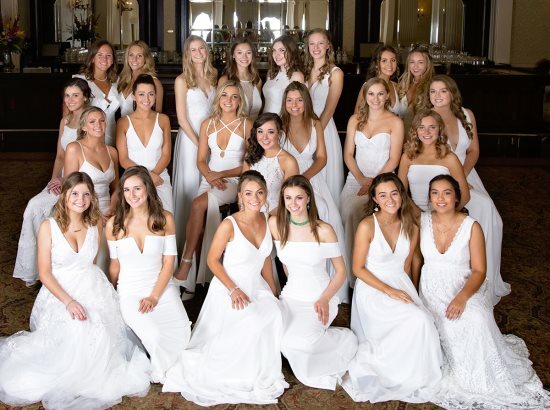 Members of the Class of 2019 include: bottom row, from left: Caroline Kallgren, Mackenzie Carlin, Sophia Lindgren, Abby Lapporte, Amanda Glynn, Tori Fleming; middle row: Blaire Murphy, Betsy Robison, Savannah DeCarlo, Sara Melohn, Juliette Benazra, Jackie Geannacopulos, Katie Clare, Paige Danforth, Avery Lyon; back row: Zoe Crouch, Christina Crum, Bridgette Schafer, Shae Silva, Maja Moran, Sydney Bagley, Layla Wright, Bri Hoover.